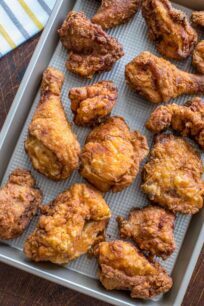 This Fried Chicken Recipe is soaked in buttermilk and is super crunchy on the outside and tender on the inside. A great and easy dish that is perfect to entertain guests or host a game day. When it comes to comfort food, this is our favorite meal. It is easy to make and full of flavor. We brine the chicken in buttermilk and pickle juice, infuse it with spices and seasoning, which results in super crispy meat. Our other homemade favorites are fried cheese sticks, crab cakes, and bacon wrapped shrimp with brown sugar. 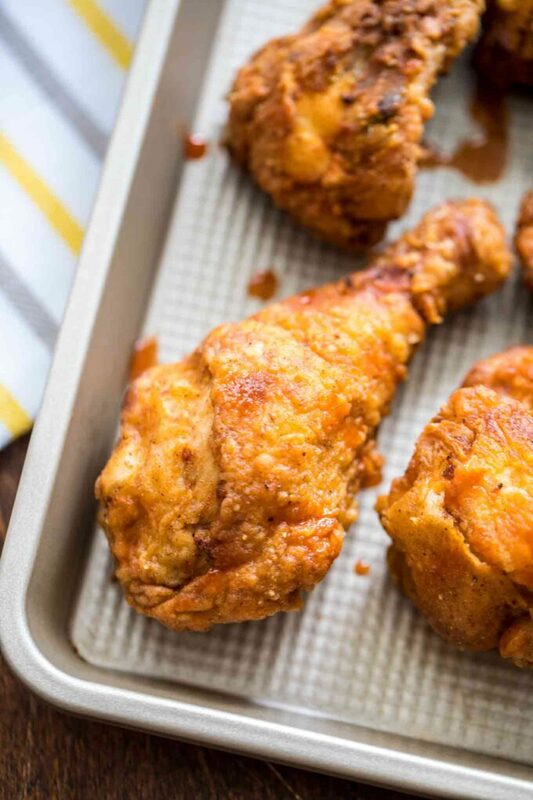 This Fried Chicken Recipe is always a winner. We have been making it for many years and is by far our most favorite chicken recipe to make. We soak it in buttermilk and pickle juice at least 30 minutes in advance, which leaves the meat super tender and moist on the inside with a crispy texture on the outside. For the PERFECT finish, we coat it in the flour mixture with spices and seasoning. This combination gives this dish ultra flavor and tenderness which is just irresistible. Similarly, you can keep it simple with just flour, salt, and pepper. No matter which path you go with, we guarantee you will love it on your first bite. How to make the chicken super crispy? Double dip the poultry in buttermilk – after dredging it with flour, dip in buttermilk, and again, toss in flour, this makes the chicken super crispy and tender. Use iron cast skillet – we recommend doing so as the iron cast skillet maintains the heat better, and spreads it more uniformly throughout the cooking process. Let it rest before frying – resting the meat after coating it with flour and dipping in buttermilk will form a nice and perfect crust. Preheat the oil – before placing the chicken in the skillet, ensure the oil reached the right temperature. The oil and heat should be about 350 degrees F prior to cooking. When you add the chicken, the temperature will drop. Keep it at 300 to 325 degrees while it is frying. If it is too hot, the outside will get burned. Do not overcrowd the pan – Similarly important is not to overcrowd the pan with poultry when frying. Try using smaller batched for ultimate results. How long should fried chicken rest? Try not to fry it immediately after dredging as it usually results in the coating to peel off. So is best to let it rest for at least 10 minutes on a wire cooling rack while oil heats. Resting it properly helps the coating stick, which results in a crispy skin. What oil is best for frying the chicken? When frying it is highly important NOT TO USE low smoke point oils such as extra-virgin olive oil. This will cause a bitter taste which you want to avoid. 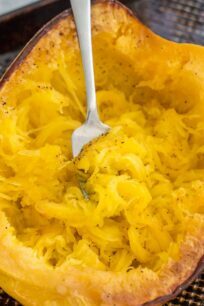 Instead go with canola, vegetable or peanut oil as they have a higher smoke point and are ideal for this recipe. What to serve with fried chicken? HOW to store fried chicken? It is best to refrigerate it in a shallow airtight container or wrap tightly with a heavy-duty aluminum foil or plastic wrap. Then, store it in the fridge for up to 3-4 days. However, once refrigerated it may not be as crispy as before. Reheat it in the oven or microwave. Before frying it, bring the brined meat to room temperature. It is best to remove it from the fridge at least 20 minutes prior to cooking so the meat is not too cold when placing in the oil. Once fried, don’t keep it on a paper towel for too long as it may result in soggy meat. Instead, drain the chicken on a wire rack. This will result in a crisp texture. A quick way to ensure the oil is hot enough for cooking in by placing the tip of a wooden spoon in the oil. If you see little bubbles form around it, the oil is ready to go. Similarly, you could use a thermometer to measure the oil temperature, this is the most accurate way. Cut the chicken and discard the backbone. We usually cut the chicken into 8-10 smaller pieces. 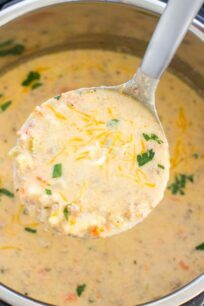 Add pickle juice and buttermilk to a large bowl, stir to combine. For a spicier kick, add some hot sauce as well. Next, add the chicken pieces into the mixture. Set aside for 30 minutes, or refrigerate for up to 24 hours. In a medium shallow bowl mix flour, salt, pepper, garlic powder, and paprika. Place a wire rack onto a baking sheet and set it nearby. Remove one chicken piece from the buttermilk mixture, toss it well into the flour mixture, and place it onto the prepared cooling rack. Let it sit for 20-30 minutes. To save time, you can add the flour mixture to a large baking dish, dump the chicken into it, and toss to combine, before placing it onto the cooling rack. Place a large/deep frying pan and fill it 1/2 full with oil. Heat oil to 365 degrees and fry the chicken in batches careful not to overcrowd it. Cook chicken for 10 or more minutes, until crispy and golden brown. Remove and set aside on a cooling rack placed on top of paper towels, to drain chicken of excess oil. Serve with your favorite sauce and enjoy. I don’t fix fried chicken very often because it isn’t as healthy as most chicken meals. I always use my cast iron skillet when I do fix fried chicken. 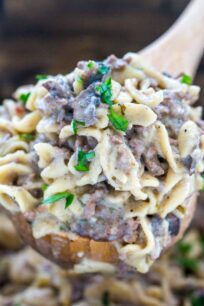 That looks so good and I have Chicken in the Freezer waiting to be cooked so I can’t wait to share this recipe with my husband and see if he would like to make it for dinner. Yes please. I just love fried chicken. I actually have never tried making it on my own. I really should! I love fried chicken. There’s something to be said about a good piece and deep-fried chicken. I don’t eat it all the time but when I do it as a special treat. It looks amazing. Oh baby – I AM SO DROOLING OVER THIS! And I would make it in my air fryerrrrr! Ugh, YUM! This fried chicken looks so yummy and crispy. Looking forward to giving it a try and adding it to our families weekly meal plan. Now this sounds like an amazing recipe! I have to admit I love fried chicken but I don’t have it often and 100% have never tried making it myself. That looks like it came straight out of a restaurant. Impressive! I’ll have to make this for my family some time. Oh my, this looks so good! I am going to have to try it. I am from south Georgia and we love some fried chicken, I have tried to make it all different ways will add this to the list! Your recipe looks awesome. It’s also kid-friendly. I’m now excited to try this at home next time we fry chicken. I haven’t mastered fried chicken and I adore it. My gramma spoiled me. She could fry a chicken that would make you weep, it was that good. Thanks for these tips. I have been frying chicken for years but have never did a brine before. Your chicken looks really good, I can’t wait to try your recipe. Your fried chicken looks super yummy!! I have my own recipe that I love but need to try yours and compare the two…LOL!! My boys love fried chicken big time. The use of pickle juice is interesting I’ve never tried that before. I will have to try your recipe ASAP. This recipe sounds amazing. I love fried chicken. I’d love to make it myself sometime. This is sure to be a hit. Which kind of pickle juice did you use? Dill, Sweet, Bread & Butter? Im drooling rightnow on your friend chicken recipe. We all love homemade friend chicken it is quick and easy to make. Cant wait to try this tomm. I need to get a big cast iron skillet. I have a couple smaller ones, but nothing that I could fry up a bunch of chicken in for everyone. Has anyone ever tried baking this fried chicken, recipe is amazing? 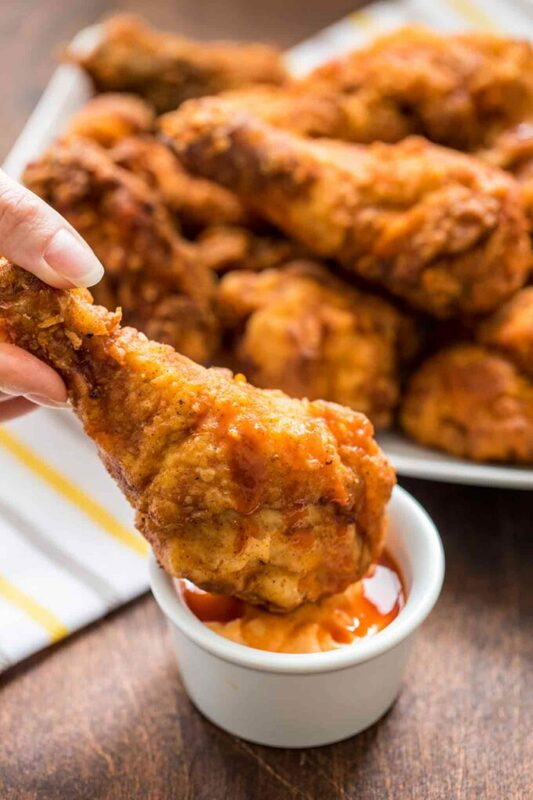 Has anyone tried baking this amazing fried chicken recipe?